Residents in the path of wildfire smoke can take certain precautionary measures to protect their lungs from smoke pollution. The elderly, children and individuals with heart or respiratory conditions in particular are advised to filter air, limit outside activities or otherwise temporarily leave the impacted area. Children are especially sensitive to smoke pollution because their airways are still developing and they breathe more air per pound of body weight than adults, according to the Centers for Disease Control and Prevention. Check local air quality reports. For real time updates on the air quality in your neighborhood, plug in your zip code at the Environmental Protection Agency's Air Now website. Keep indoor air clean. Keep your house and car windows closed. Run an air conditioner, but keep the fresh-air intake closed to prevent outdoor smoke from getting inside. To reduce exposure to smoke and smoke residue, the California Air Resources Board recommends mechanical air cleaners with a high efficiency particulate air (HEPA) filter that collects very small particles and does not emit ozone or other harmful substances. These air cleaners can dramatically reduce indoor particle levels, in some cases by more than 90 percent. See devices that are certified by and legal in California here. In homes without air conditioning, keep doors and windows closed. This can reduce pollutant levels by 50 percent. Avoid activities that increase indoor pollution. Burning candles, gas stoves and vacuuming can increase indoor pollution. Wash your nose out and gargle with clean water. Do this five times a day until the smoke subsides. Take a shower and wash your clothing after being outside. Choose a respirator mask labeled N95 or N100. These special masks filter out fine particles and can be found at many hardware stores and pharmacies. They are also sold on Amazon. Avoid a one‐strap paper dust mask or a surgical mask that hooks around your ears as they don’t protect against fine particles. Avoid bandannas, towels, or tissue. 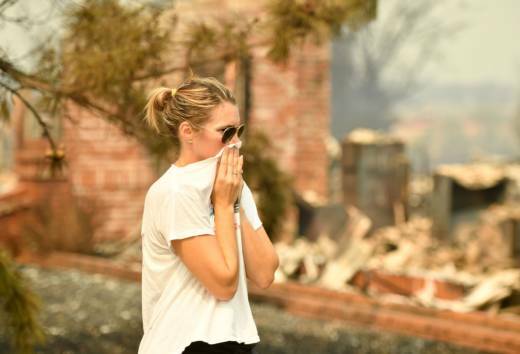 Although they may relieve dryness, they won’t protect your lungs from wildfire smoke. Wildfire smoke is a shifting blend of gases and particles, including carbon dioxide, water vapor, carbon monoxide, hydrocarbons and other organic chemicals, nitrogen oxides and trace minerals. There are thousands of individual compounds, many of them toxic. But what worries doctors most is the particulate matter in smoke, the tiny bits of feathery ash and dustlike soot, much of it invisible to the eye. They are especially worried about particulate matter less than 10 microns wide, known as PM 10. (By comparison, a human hair is about 60 microns wide). They also dread the subset known as PM 2.5, for particulate matter less than 2.5 microns wide. The particles first damage the body simply by getting inside of it –- triggering inflammatory reactions that themselves can trigger breathing difficulties, heart attacks and even strokes. Within a few days of smoke exposure, damaged lungs can succumb to bronchitis or pneumonia. In pregnant women, exposure to particulates has been associated with premature birth and low birth weight in infants.